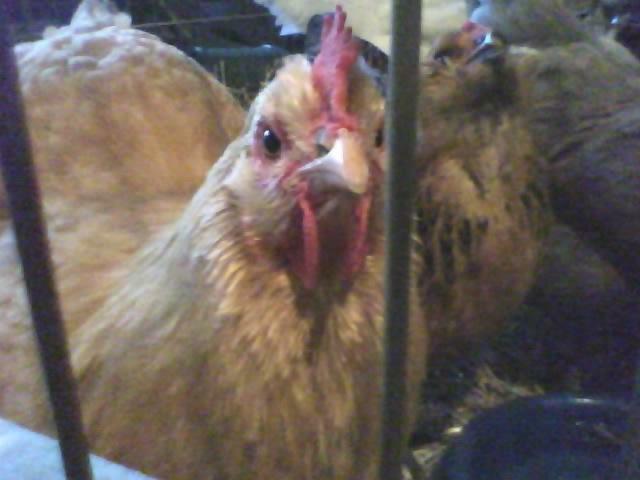 I have 3 EE'r hens and one Buff Orpington hen. I also have a 14 mo. 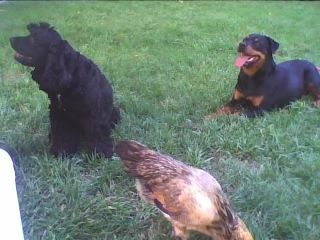 old GSD shown below, a rescued rottwieler (age unknown), and two litter mate cocker spaniel boys I rescued from an overwhelmed backyard breeder. I got them about a month apart. 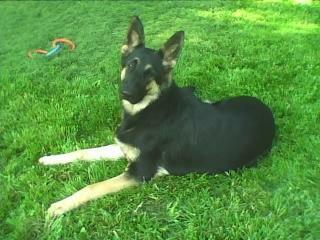 She is 5 months old in this picture. Nice pose there dogs! 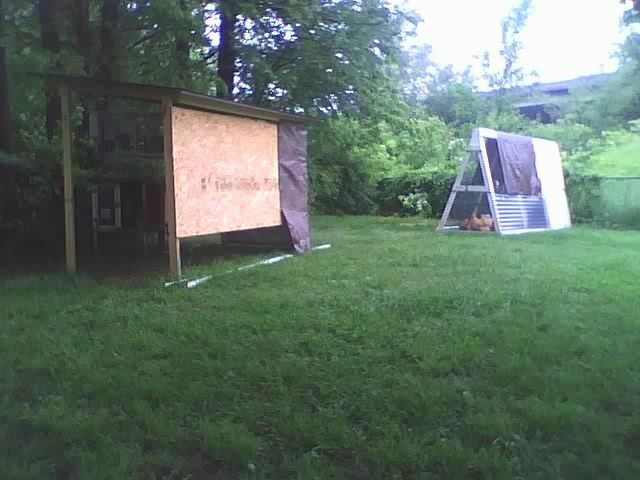 Here is our chicken tractor, and the new rabbit shed. I just purchased 4 Florida White meat rabbits and will be raising them for food for us and the dogs. 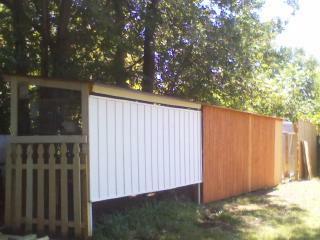 This corner will be fensed off so the chickens can have the entire corner with the bunny shed. They sure love digging in the rabbit droppings. This page is in tribute to my wonderful pets and new found home. It sure is fun putting everything together and making it our own. We are growing more and more interested in sustainable living. And yes... he is a cocker spaniel in a poodle hair cut......... Nobody else notices, so just bypass it please. It gets him alot of attention and he likes it. The women flock around him... as he is just to PRETTY. Look! The ladies have been busy this week. I guess the snow is not affecting them to much. They only started laying 2 months ago. I love my girls...... and they sure help me make one mean omelet. 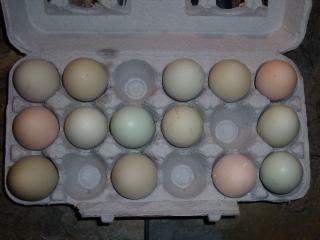 I have plenty of eggs now that the ladies have kicked in. 4 hens have been more then enough for 2 people. And I usually have some to give away. I love the taste of them and am amazed at how flavorful they are. Excercise, training, obediance, consitancy, repitition has come through for us. Some dogs just take longer then others. This dog is way more high strung and energenic. 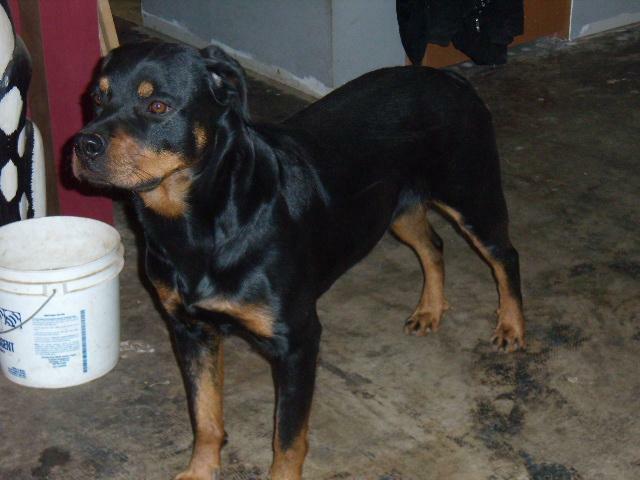 She also came to us as a starved rescue, so who knew her background. 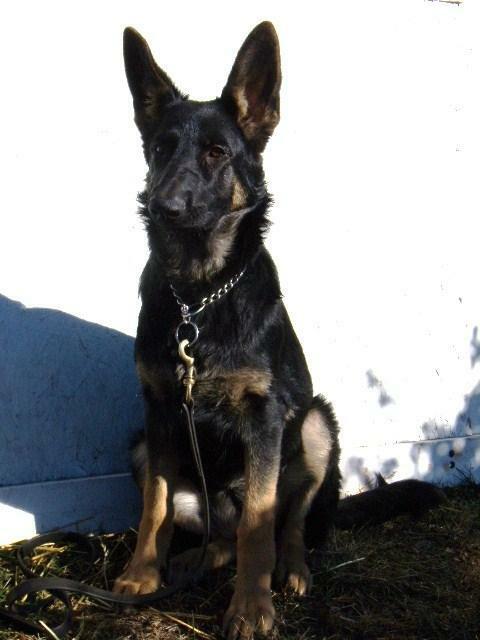 She came to use with extreme obsessiveness which with good training, excercise and obediance she has turned out to be an absolutely amazing dog. 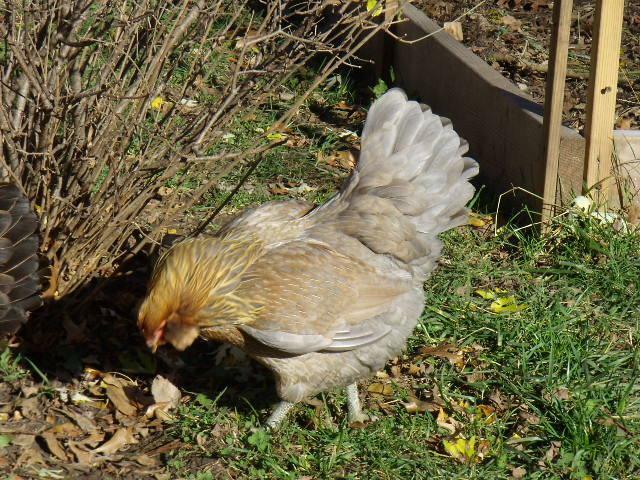 I have seen her flying through the yard after a squirrel and the chickens "scatter" and run in front of her and she sails over the top of them to avoid hitting them. I am very very proud of how she has turned out. Yeah! for Miss M.
This picture was taken 2/5/10 and I just love the artsiness of it and the feeling it gives me when I look at it. I love it. 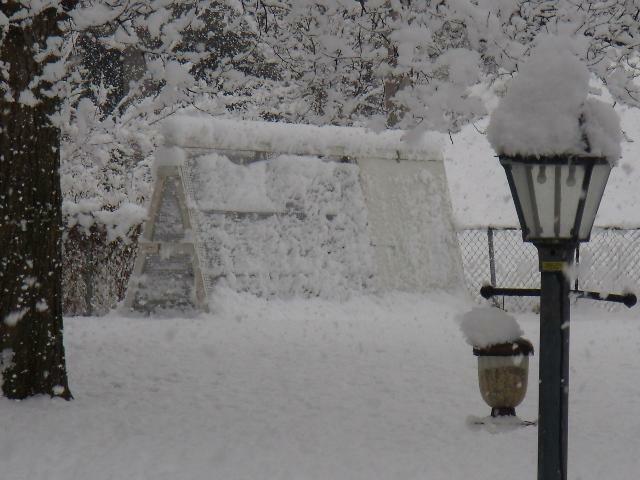 This is one heavy heavy wet snow. 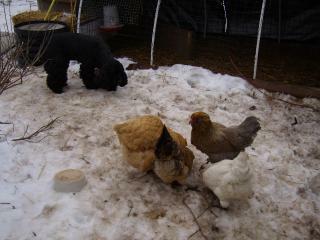 The chickens were in the hoop house area closer to the house. It worked best for us last year. 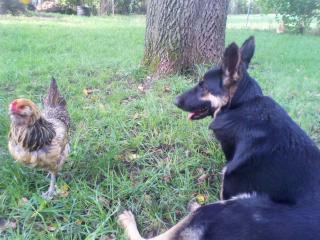 Here is my girl and one of her chickens. I fostered her mom last year. Mom had 10 living puppies, this is the one I kept. 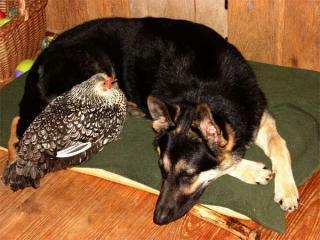 Above is the brother to my GSD and his chicken Bernadette. 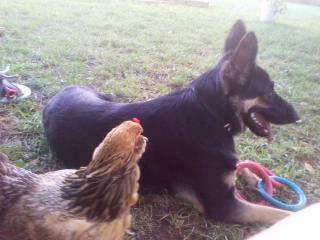 My girl and the chicken that gives it back to her! Cheatah, you go girl! 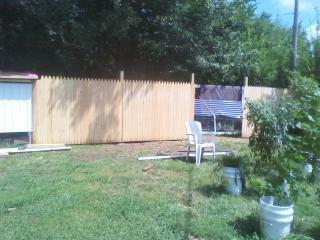 [This is the back corner pictured at the beginning. 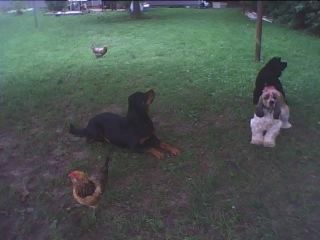 Now the chicken tractor is behind the fence and the ladies have that entire area to roam in all day. with gravel. 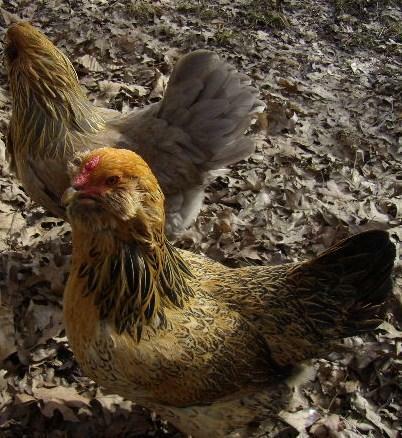 The chickens work the droppings from the rabbits and till through the bugs and it gives them more added protection from the elements and preditors. The addition looks great and here is the manure pit. 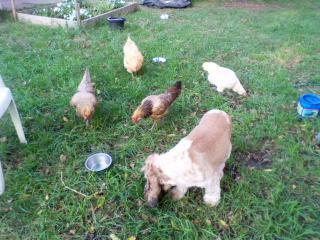 Mason finishing his dinner and the chickens were wanting to take it from him. I actually had to back the chickens off his food. The ladies crack me up! We added 3 new EE'ers to the group and I will try to post pics soon. 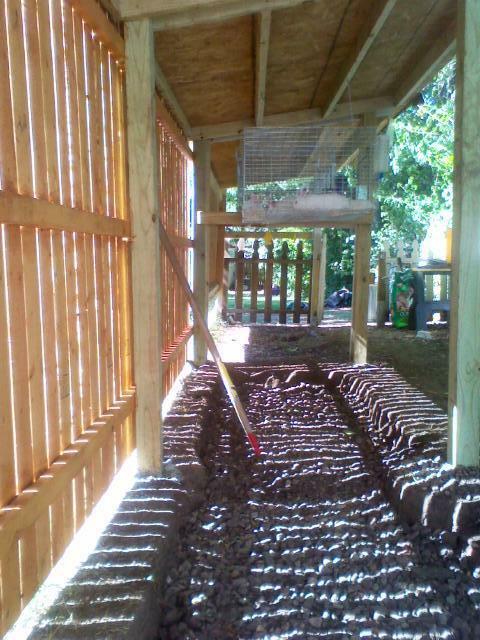 The rabbit area is finished and we have 9 hanging cages. We are very happy with the set-up. It works real well having the chickens and the rabbits in the same area. 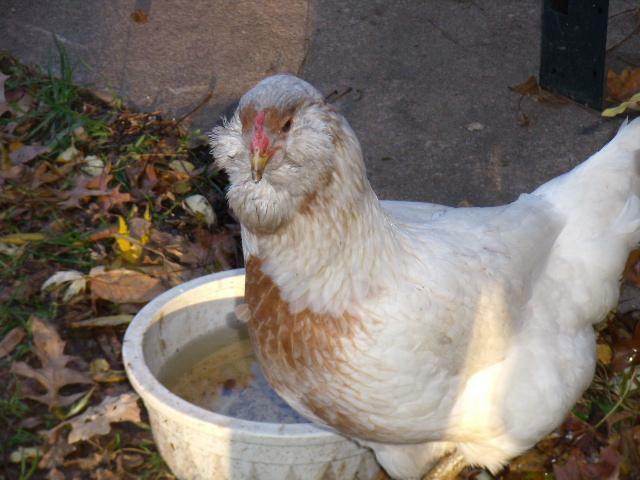 The chickens also help keep any rabbit odor down. The lady w/2 rescued cocker spaniels, rescued rottwieller, german shepherd, 5 city chickens, 6 meat rabbits, their kits and a Bumble Bee ball python living in harmony on 1/2 city lot.